Looking great there David. Very anxious to know how they work out for you. Keep us informed!!! Wow, I'm jealous. I bet you're having a ball. How did the molding go? Were there any hang ups or difficulties that you weren't expecting? Well I found a way to get my mill to cut all 3 dimensions of a saddle. My problem was that I was trying to duplicate the curved radius at the top when that's not necessary. There are only 6 strings so as long as they're at the right heights (following the radius) then each string landing can be straight across. I wrote a CAM program for the saddle top and made up some ebony, rosewood & birdseye maple blanks for testing. I cut one from ebony, sanded the sharp edges then I came in to make and eat a turkey sandwich with chips and a can of root beer. As soon as I'm done with that I'm going to install it in my WD32SW to check the intonation and see how it sounds. I don't expect much in the way of sound because the ebony is even softer than the plastic but I'll let y'all know. Yes, a Sony Millstation. I own a small machine shop. Well I've got the ebony saddle in the WD32SW and I've got to say, it doesn't sound bad at all. Just a hair quieter but it took the slight brittleness out of the sound. I know it will wear pretty quickly but I might make a few more just for this guitar because I really like the sound. Intonation is very good too. I do plan to make several from the rosewood and maple too, just for testing and fine tuning of the CNC program. 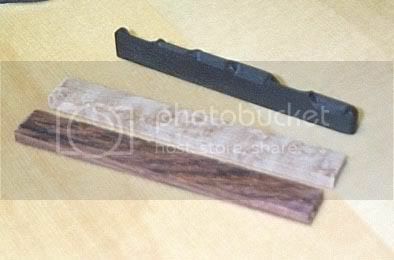 Once I'm happy with everything I plan to make several from bone, Corian, Snakewood and Lignum Vitae for sale to benefit the Guitars For Kids program (Snakewood and Lignum Vitae are VERY hard woods and I believe neither floats in water). I might fool around with some plastics/composites too but it looks like David L. has that well covered. Maybe I'll make a video with good quality audio showing the sound differences of the different materials. I'm excited about what you are doing, Dreadman. A way to mass-produce bone is certainly the holy grail. I've been casting non-stop, with all sorts of composites... fused silica, bone ash, powdered marble, various earth compounds. Still waiting on delivery of powdered porcelain and milled carbon fiber. I've installed a couple, with decent success so far. I haven't found the perfect solution yet, but I doubt I ever will . If anyone wants a free saddle in trade for giving me feedback on how it compares to whatever you are currently using, just e-mail me an address and I'll send you one (or more than one, if you are willing to do the work of swapping them out!). Once we've each got a pile of finished ones we can make a trade. I'll include all of both of ours in the comparison video to make a definitive record. Well that was quite a forum outage, huh? Once I detoxed I ended up working, then when that got boring I made a fixture for milling saddles. [ ] I didn't like the look or feel of the top of the first milled saddle because it felt bumpy and looked rough so I set out to get that radius on there. What I came up with is a fixture that allows me to machine the radius in one set up then flip the fixture over to machine the compensation. The fixture is basically a precision aluminum clamp that mounts easily in the machine vise. I cut the top radius on about a dozen wood saddles yesterday and the following video ( I like having a video camera [ ]) shows this process from a few different angles. At the end I flip the fixture and put in the saddle that I cut straight compensation on just to show the position it will be in for the next process. Hopefully I'll have a matching video in a couple days to show the compensation being cut. I received the carbon fiber last night, and cast a series with various formulations. A warning to anyone: that stuff takes extreme care. Not a problem in long fiber form, but when it is finely chopped/ground it easily goes airborn and is very irritating to skin and lungs. Anyway, I didn't get to install one and try it out yesterday, but up to this point they look excellent. They are very hard - in fact, it takes quite a bit of work to sand down the bottom edges. It's interesting that they don't ring - you know, the story has always been that saddles should sound like glass when dropped. Instead, they sound more like wood. I'll try it out tonight. Still waiting on the porcelain to arrive... hmmm, maybe a porcelain/carbon fiber mix?! What were the various materials you were using to make the saddles? Birdseye maple, rosewood & ebony. I've decided against all wood for anything except screwing around though. After just one day on my WD32SW the string grooves in the ebony were terrible. I'll use these ones for proofing CNC programs but that's it (unless anyone else wants to try one).